The Rockport Film Review: Eduardo Sanchez's "Lovely Molly"
Whenever director Eduardo Sanchez's name is brought up the words "co-director of the Blair Witch Project" will inevitably follow. The two-sided coin of being responsible for a complete shake-up of the entire film industry, but then spending the rest of your career trying to recapture former glory, also known as The "Shyamalan Effect". As a solo director, he followed up with the mediocre "Altered" in 2006 and the unwatchable "Seventh Moon" in 2008. 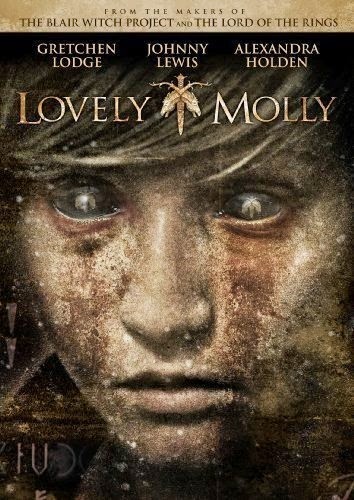 So when "Lovely Molly" came around in 2011, needless to say, expectations were pretty low, and after a bit of hesitation, I found the time to see it. I can honestly say that this is by far his best film. The characters, the story, and just about everything put on screen it is right on. "Blair Witch" in itself was not a great movie, but its effects on how films are made and marketed are still felt today. Conversely "Lovely Molly" is not going to have the same effect but is a far better film. "Lovely Molly" owes the majority of its success to Molly herself, played by Gretchen Lodge. A young woman looking to reclaim her life after a battle with drug addiction and brutal childhood. A newlywed who moves back to her childhood home with her husband Tim (Johnny Lewis), a truck driver. Molly works as a shopping mall janitor with her supportive sister Hannah (Alexandra Holden). Maybe moving back to her childhood home was not such a good idea, as her mental state takes a steep dive as repressed memories, hallucinations, and ghostly encounters meld into one terrifying situation after another. There are your classic horror clichés' of creaking doors, investigating noises in a dark and such, but Lodge's fearless and dedicated performance puts this film above others. It falls into the category of slow burn psychological horror, which can sometimes be code for stupid and boring, but the story and characters (mainly Molly) are given time to develop. Although it does have its share of horrific imagery it doesn't lean on. A big part of the storyline involves Molly's creepy video diary of her stalking around her neighbors and wandering in the woods. Yes, sort of "Blair Witch-esque". She seems to be possessed during these nightly escapades. The opening of the film shows her on the other end of the camera with a knife to her throat wanting all of it to end. Is everything that happens to her real or is it all in her disturbed mind? This is the main question the film asks and some people will not like the answer. But I think Sanchez did the right thing in how he chose to end the film. After a repeat watching Molly's story really is a lot deeper than what lies on the surface. There is Nowhere to Hide When "You're Next"
"Broken" One of the best Unseen Films of 2013!